There may be more bytes, but are any of them worth chewing on? Big Data is touted as the key to transforming the health care industry, capable of unlocking the secrets to enhanced quality, reduced costs, and better care management and coordination, as well as boosting overall population health. There are plenty of data out there to work with, too. According to the Institute for Health Technology Transformation, by 2011 the US health care system had reached 150 exabytes of data and was well on its way to the yottabyte (1024 gigabytes) scale. In 2013, Oracle reported that health care organizations were accumulating 85% more data than they had just two years earlier. It would appear to be an embarrassment of riches, but there is a significant obstacle preventing Big Data from realizing its full potential in health care. "First, we have to figure out our little data," says Bill Spooner, former CIO of Sharp HealthCare and the College of Healthcare Information Management Executives' 2009 John E. Gall Jr. CIO of the Year. In other words, the rapid accumulation of yottabytes of data means nothing if that information isn't actionable. "If I'm losing money as an organization, I need to be doing some kind of analysis. Whatever I determine to be out of line based upon benchmarks, gut feeling, or experience that I believe I can impact, that's actionable data," Spooner says. "A lot of the work that hospital analytics functions are doing involves extraction of reporting indicators for various public programs. Meaningful use is a good example because we have all these indicators to work with. … All of the reporting just to ensure compliance with meaningful use occupied time one might argue could have been better spent taking on the actions. We spend so much effort extracting the data that we don't have time to follow up on the action." The solution? "Stop dreaming up one more piece of data and let the providers work on" what the data are telling them, Spooner says. Data that are standardized and codified. Data that can be turned into business insights. Data that can be used to identify and resolve specific organizational problems. There are many definitions of actionable data, but they all share the common theme of usability. Today's health care organizations are inundated with data flowing from multiple disparate systems, including EHRs, pharmacy, radiology, and laboratory. But data accumulation isn't limited to strictly patient information; huge volumes of financial and claims data also are being gathered at breakneck speed. "The most progressive and clever organizations are using data from all these sources," says Stephen Borders, director of the Center for Health Analytics at Grand Valley State University. "The widespread implementation of EHRs as a result of the Affordable Care Act presents the opportunity for organizations to engage in [and] perform advanced data analytics, but I would argue that many care systems, often small and medium size, are unable to really harness that information. I would point to the evidence around the Centers for Medicare & Medicaid Services' [CMS] meaningful use [program]." While stage 1 of meaningful use provided incentives for provider organizations to adopt compliant EHRs and other HIT systems capable of collecting all these data, it didn't require much in the way of high-level utilization of that information. It wasn't until stage 2 that hospitals and eligible providers were required to really dig into what their data showed to meet increasingly complex reporting requirements. It should be easy to comply with the meaningful use measures using simple numerators and denominators; for instance, recording vital signs or smoking status as structured data for more than 80% of all unique patients admitted to a hospital. But hospitals continue to struggle to the point where the CMS relaxed the rules on stage 2 attestation. Indeed, by August 2014, only a tiny fraction of the nearly 5,000 eligible hospitals registered to participate in the meaningful use program had successfully attested to stage 2. 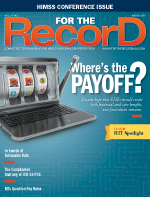 "I worked with a small hospital system that was unable to produce even the most basic numerator and denominator data from the EHR system despite spending several million dollars on implementing that system," Borders says. The problem is twofold, he says. First, many hospitals and health care systems are struggling to get their EHRs to produce basic information, a situation exacerbated by the need to devote the majority of analytics resources to the process to avoid financial penalties from the CMS. Second, because there's a heavy focus on compliance, all but the most progressive systems have trouble dedicating significant attention to higher-level analytics. "In my mind, advanced data and analytics have not come to hospitals yet, but it will. It has to," Borders says. "In addition to the organizations that are using advanced data analytics are the insurance companies. …Because they paid claims for years, they have the data to actually engage in advanced analytics to a degree that many hospitals—which are solely focused on the acute care side of the care equation—do not. The big HMOs have data for a full spectrum of care and know more about what types of health care services patients consumed and how and where that care was provided." Kathy Giannangelo, MA, RHIA, CCS, CPHIMS, FAHIMA, president of KG Consulting, believes meaningful use has added value to health data, noting that widespread EHR adoption under the program has resulted in "data becoming increasingly standardized and codified, resulting in an increase in actionable data." Hospitals can use actionable data, in particular those that are collected through electronic quality measures, to create quality improvement strategies. The problem is that "there is still data that is unstructured, making access and use difficult," says Giannangelo, a noted expert in clinical terminologies, classification, and data standards. One solution garnering more attention is the concept of data normalization, wherein "data from multiple disparate sources is converted to a common standard representation," she says. "Examples of where normalized data comes into play in the hospital environment are in the ability to exchange health information with other health care providers and population health management." According to Borders, normalizing data is all about benchmarking, a concept in which hospitals attempt to determine how they compare with peers in order to find the best direction and readjust strategies if necessary. Without standardized data, that process is exponentially more complex. "Although meaningful use is not necessarily data analytics, it is a vivid example of the challenges of obtaining data for decision making," he says. Spooner goes a step further, noting that normalization is about more than the technology involved in codifying data from multiple systems. It's also about the change management that drives how data are entered into the system from the start. Normalization "is looking at the data and bouncing out the real anomalies that don't belong on the normal curve to get a better view of what" is being analyzed, he says, but it also has "a behavioral side in a couple of respects." For example, when systems are not highly structured, a clinician can easily record the same piece of information in three different places in three different ways within the same record. To leverage that information for reporting or statistical analysis, it's necessary to mine it from all three locations. "That is a case of inconsistent use of a system," Spooner says. "Organizations are getting better at uniformity and better education and use of patient records, but there are still problems. …You still run into the anomalies where you expect data to be recorded in a structured field but it's really somewhere else in a textural manner that doesn't mean much." When health care professionals see how far the industry has come in terms of technical standards and the ability to exchange data between systems, it's easy to become frustrated and impatient with interoperability, he says. In addition, within each health care organization, there are behavioral aspects hindering consistent reporting. "Let's call a CBC a CBC, for example, so the data we're exchanging with our neighbor across town is in terms they can understand," Spooner says. "People may use various—all acceptable—terminology, but when it's mashed together you see the same thing in three different ways. It's going to take a long time to educate the provider community [on] using more uniform terminology. …They're not robots." No discussion of data is complete without examining the need to protect data's long-term integrity and usability. Indeed, data governance is perhaps more crucial for actionable data than many other types because of the weight it carries in terms of organizational decision making. For example, while a great deal of emphasis is placed on accessing real-time data for decisions at the point of care, historical data are equally crucial to long-term success. "I use historical data all the time to make predictions about future events," Borders says. "Real-time data can help with some situations, such as when a patient misses an appointment or lets a prescription refill lapse, which might indicate that they are noncompliant with a treatment plan. In such cases, real-time data is useful. [However], historical data can be useful for planning and making predictions about the types of volume of cases a health care provider or hospital system is likely to see in a given time period." For that reason, hospitals and other health care organizations should not skimp when it comes to dedicating resources to data governance. Spooner points to one large hospital system that has a governance process so rigorous that any additions to the data model must be presented to a committee for approval. "Their database is well defined, the data elements have owners and uniform definitions so everyone in the organization can understand them," he says. "They have control over the database, so if I want to add a new element it goes through a review to make sure it fits with the organization's goals. …You like to believe that your organization is wonderful, but when you get a little beneath the covers, data governance is for everyone." Being on the lookout for suspicious data activity can be extremely helpful, Spooner notes. "At some point you start seeing a lot of perceived variations, so you have to understand when the variation is real or when it is people recording the data differently. Is this an anomaly or a mistake?" he says. "As we progress over the next several years … as you start trying to fine tune data, governance and data integrity becomes more and more crucial."